Do you believe that your organization is living up to its full potential with exceptional leadership and a caring, engaged workforce? Does a clear vision and mission exist that highlight what the organization is building and why it exists? How well are the people aligned on this vision and know their individual contribution is to help achieve success? Do core values exist that define expectations of employee behavior? 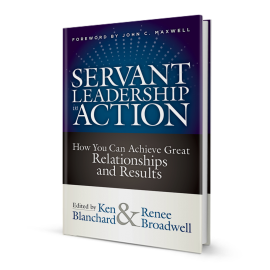 How are you preparing your leaders to be successful in accomplishing their objectives? How are you documenting your priority business objectives with accountability for each established? How would you assess the level of performance of your executive and middle management teams? When organizations need change, they often spend lots of money on initiatives and training programs that do not result in any significant, long term real change. Senior executives are responsible for enabling the success of their people often do not know where to go for help. I can help committed leaders grow their people and ultimately improve performance. My methodology to help organizations is described briefly in four phases. I. Assessment. A comprehensive assessment of the strengths and challenges in the organization sets the foundation for future goals. Assessments are conducted to determine the priority needs of the organization to improve business outcomes. The results are discussed with leadership and agreement is secured on the priorities to be addressed. II. Plan. A plan of action is developed based on priorities. I am committed to using proven methods based on my own experience and my partnerships with world-class leadership development organizations. Recommendations may focus on strategic priorities like creating winning cultures or gaining alignment in the organization through the development of a comprehensive business plan. At the operational level, recommendations may focus on individual leader skill development, executive team building or individual or group coaching. III. Execution. The approved plan is put into action. IV. Sustainment. Inherent in every successful strategy is the follow-up phase to cement the concepts and ensure that the people apply what they learned. Reinforcement strategies include refresher initiatives, sustainability modules, use of action plans, connecting new behaviors to performance management systems, and adopting best practices. The key here is to acknowledge that training is not a one-time event – rather an on-going process that enables refinement of skills and behaviors that ultimately lead to improved performance. Sustainment efforts can be led either internally by the organization or through external assistance. Failure to address sustainment will result in lost leadership capacity and the erosion of those skills learned in phase III. Sustainment is the key to maximizing the return on investment of the leadership development strategy. 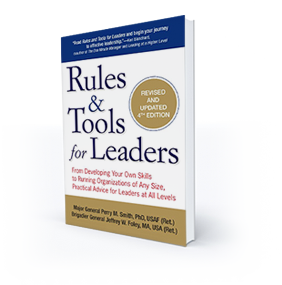 “Rules & Tools for Leaders (4th Edition): From Developing your Own Skills to Running Organizations of Any Size, Practical Advice for Leaders at All Levels.” By Perry Smith and Jeff Foley (August 2013) Available wherever books are sold, including on-line retailers Amazon.com, barnesandnoble.com, Powells.com, iTunes and Google Play.